Perhaps it was timing, or maybe the book just lacks a lot, but having just read Rashid and the Missing Body, did not do this book any favors. 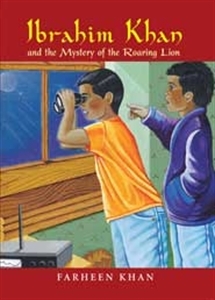 This book also features an elementary boy working to solve neighborhood crimes,. who just happens to be Muslim. The target audience would probably be any 2nd to 4th grade student, girl or boy, as it is a quick, clean 45 pages. The book is beautiful from the outside, the font and pictures inside are spot on, the story itself isn’t half bad, but the rationale for the crime and the conclusion, just seem weak and forced. Ibrahim Khan and his cousin Zayn are third graders that solve crimes in their part time. One day they get a call from Yusuf that there are lions in his backyard, he can hear them, but can’t find them. The Khan boys are on the case and with support from parents picking and dropping them off at each other’s homes around salat times, and their trusty brown bag, they figure out what is really in Yusuf’s backyard. The book is clean, it is perfect for a young or struggling reader in terms of presentation and writing style, and is a decent foray into Islamic fiction for elementary aged students. There is no unnecessary religious, or family, or boy/girl drama, but the reason for the perpetrators scaring Yusuf is very, very unbelievable and weak. Without giving it all away, it may work to talk to your child at the end about the moral, but I think any student in a school setting would find the ending a bit disappointing. None. Clean and framed well to give the reader a sense that Ibrahim comes from an Islamic family and environment, he is a Muslim, and at the same time he has friends and adventures just like any other character in any other book.